EE Keeper and negative Saving Throws. I lost ( deleted ) my final save from BG1 but I know what the saving throws were from reading an old post of mine on this very forum. And I had planned on taking this character into BG2 so I don't really feel like I'm cheating, just a hoser for deleting that save. Yet I can not set a negative ST in EE Keeper...just 0. Kinda proud of those low STs...didn't make me 100% magic proof but it sure did come close. And with all the magical junk in BG2 and level ups I should be able to drop some STs into the Negative 20s, if not lower. Again I know I'm not magic proof but it sure does cut out a lot of the small stuff. Losing that -5 is annoying as heck though. I just know between all the resistance stuff and low STs, my vertically challenged warrior is going to be wrecking ball just like in BG1. So is there anyway to set a negative value in EE Keeper ? EDIT EE Keeper sets them to 1 not 0..so I lose out even more now. I'll look into it. Probably messed up the upper and lower limit checks. The rest is either coming from spells or items. Gnome F/M start at level 1 @ 14 / 6 /13 /15 /7. I'm pretty sure when I posted my final save report a long time ago I kept any modifiers separate. Could be the Claw was not listed as a modifier...which would be my bad. Really sorry I don't have the save now because I'd figure out and prove it. I just know what I read on the screen. Really don't want to re-play it . Yeah according to wiki " Shorty bonuses" are recalculated on level up. I just started with the STs at level 1 and subtracted from level 7 STs. Added the sum of the 2 classes together. Finishing at 9 /0 /7 /8 /1 with Shorty bonuses for that race being recalculated upon on each level up. So the first 2 numbers and the last are correct...still need to figure out the 7 and 8. 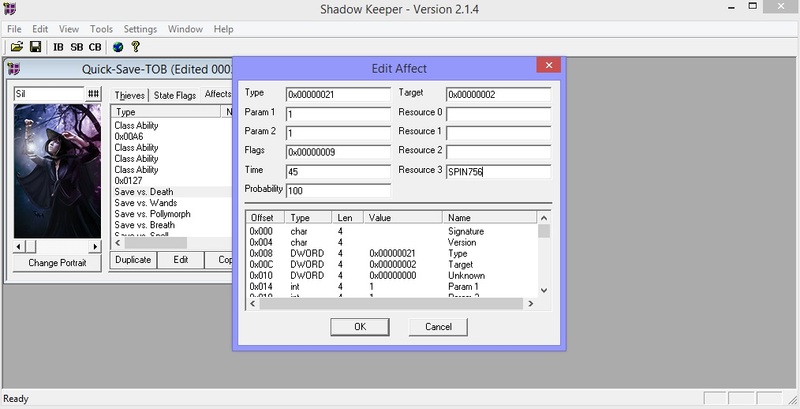 You can get negative saves with EEKeeper, but not in the "Saving Throws" tab. 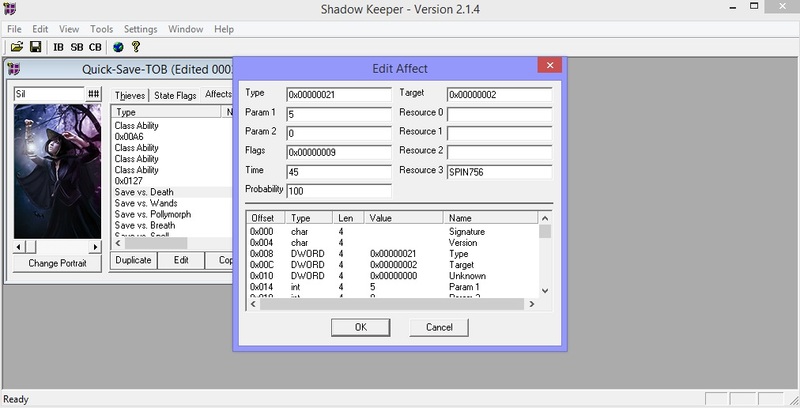 I only have Shadowkeeper, but EEKeeper has all the same features, so it should work fine with EE. 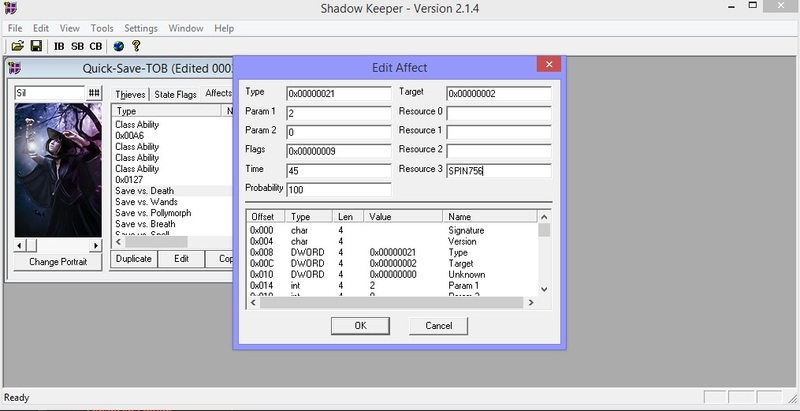 In fact, I understand EEKeeper is a little more user-friendly than Shadowkeeper. That's one of the bonuses of SPIN756, a reward from the Hell trials, which grants +2 to all saves. But this effect only grants a bonus to your save vs. death; you need to add more effects if you want bonuses to your other saving throws. The "Type" section codes for which opcode or effect your character is getting, so, to modify your other saves (save vs. breath, vs. spell, etc. ), copy and paste that effect, and then replace "21" with 22, 23, 24, and 25. You can also change the "Parameter 1" section if you want a different value than 2. So you need a separate effect for each saving throw you want to change. Parameter 2 is at 0 now, which means it improves your save vs. death by the value put in Parameter 1. So the first effect sets your save to 1, and the second modifies it to -4. Leveling up won't decrease or increase this value. If you set your saves in the "Saving Throws" tab, however, your changes will be overwritten on leveling up. I further read on the wiki that using the book that raises Con in BG1 affects STs on next level up. So between the math shown above , the Con book affecting STs, shorty bonuses and the fact that cursed items ( aka Claw ) are not listed as modifiers....I think I got it. @ The rest of you..thank you for your help. Sure but if you are starting with 18 then they don't get any better. Yes that is correct. Provided you have 18+ constitution. Not sure what you mean by "added the sum of the 2 classes together." You get the best saving throws from your two classes based on whatever level they are. So since fighters have better save vs death and save vs breath than mages you'll end up getting your fighter levels saving throws for death and breath, while your mage levels saving throws for spells, wands, and polymorph. Hence a level 7/7 fighter/illusionist with 18 con would have 10/4/11/12/5 for saving throws (not including items or spells). Create a new gnome fighter/illusionist with arbitrary ability scores. Use EEKeeper to edit your ability scores (e.g. STR, DEX, etc) to whatever you want. Use the console to give yourself 161 000 (or whatever) xp, and then level up. You'll have the same saving throws you used, assuming your CON is the same as it was for the original character. No need to fiddle with every value individually in EEKeeper. [...] the fact that cursed items ( aka Claw ) are not listed as modifiers....I think I got it. Saving throw bonuses (and penalty) from the Claw do show up on the character record screen. To be honest I'm not sure what the issue is here. The values @elminster provided in his first post are consistent with the values in OP's post, sans modifiers. Those modifiers came from items, so if you were setting your STs in EEKeeper you should set them to the base value, not the modified one. Your base values will never be negative, so there shouldn't be any problem.